Happy days are here again. Google Apps for Education has released their yearly summer toys for teachers to play with and this year they have really delivered. 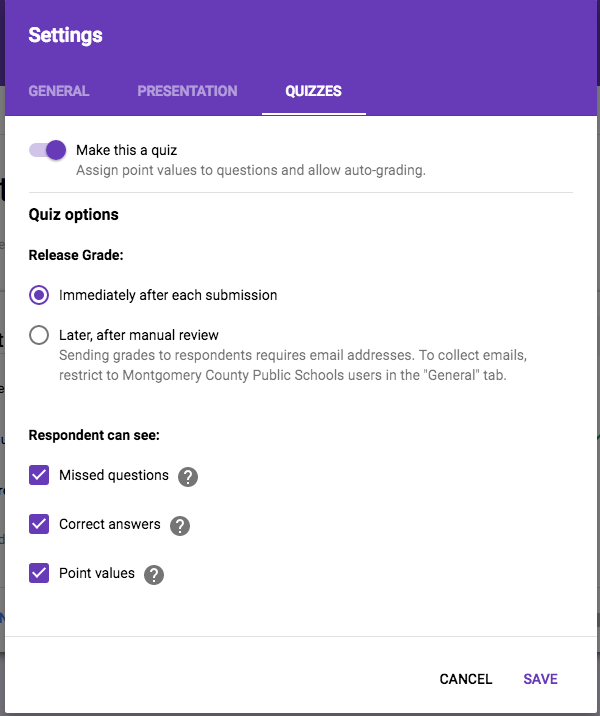 The best of these new toys, in my humble opinion, is the increased functionality of Google Forms to include a quiz option. 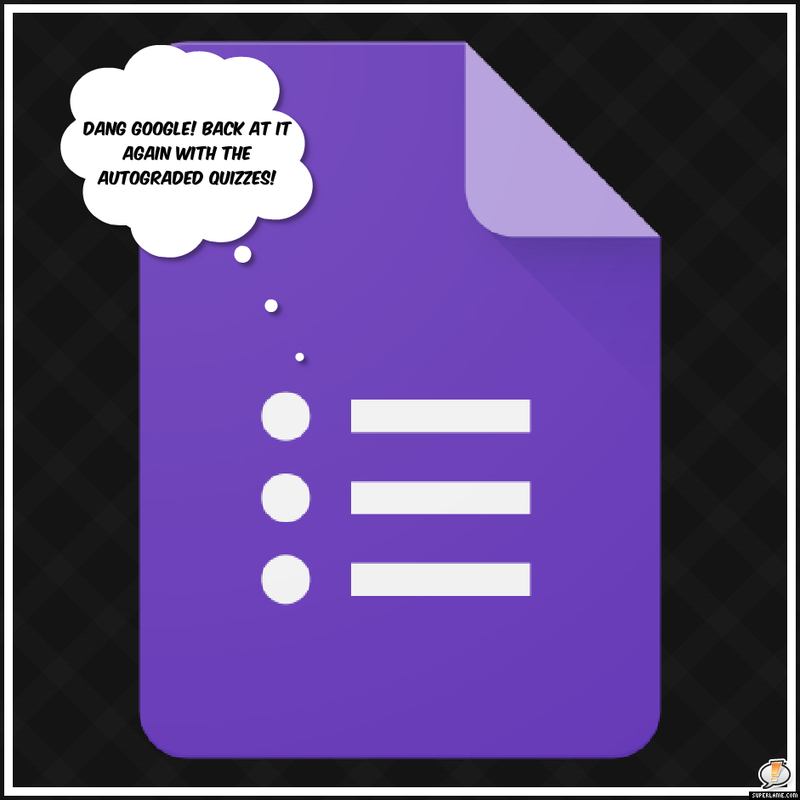 Perhaps Google heard the whispers in the classrooms because they really have done something special with the new functions of Google Forms. 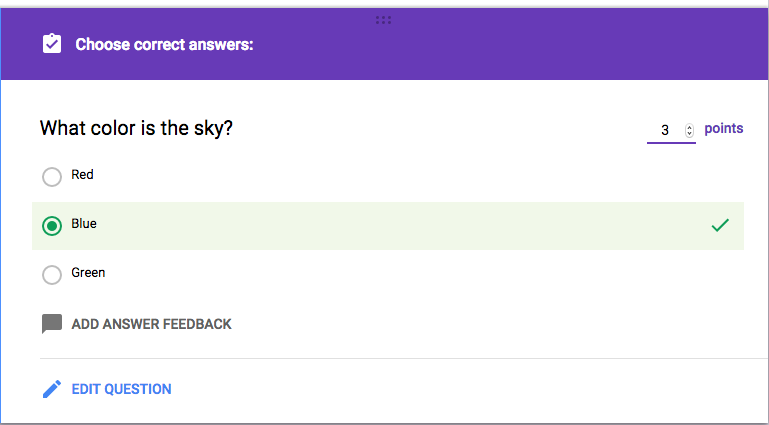 They added an auto-grading function to questions. They added the ability to make questions worth points. 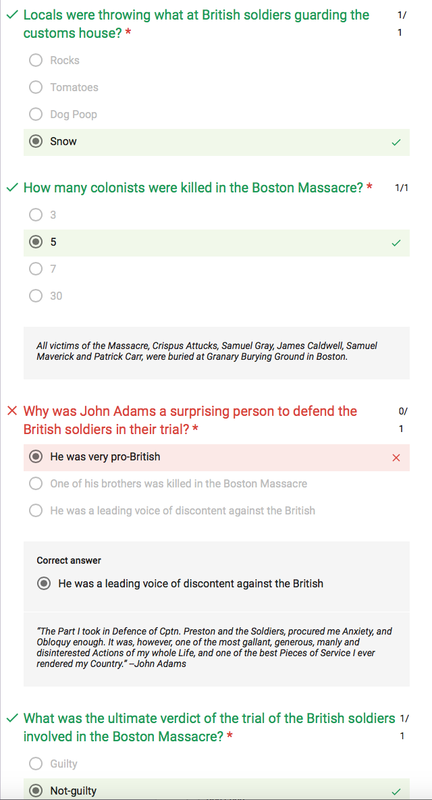 They added the ability to give feedback to students for both incorrect and correct answers. They allowed teachers to insert links as feedback. They collected the data from responses and analyzed it into easy to read charts. In short, they're back in the formative assessment game with this new roll out. 2. Click the "Answer Key" button below the question. 3. Choose which answer is correct and how many points the question will be worth. 4. 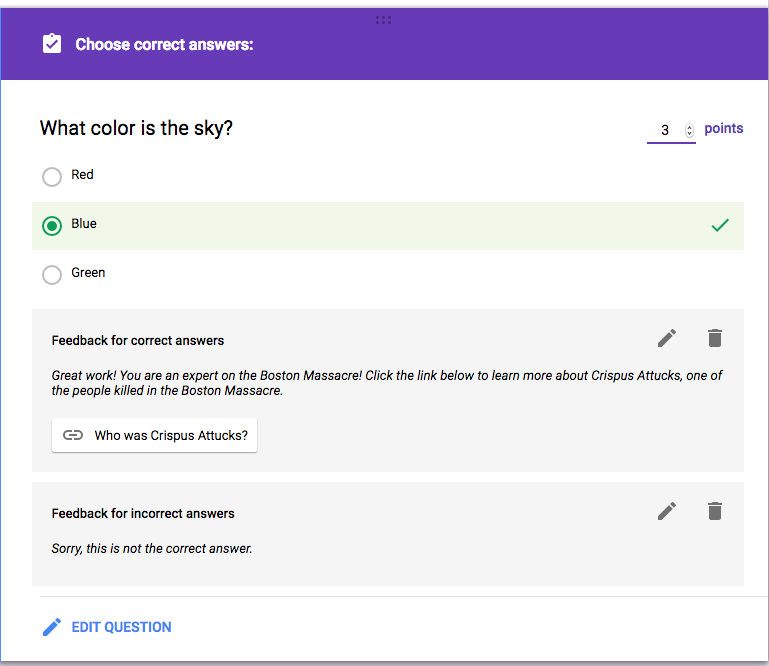 Add answer feedback for correct and incorrect answers. 5. Add links to help struggling learners catch up or extend the learning opportunity of advanced learners. Data is analyzed for teachers and even plugged into the easy to read bar graph. Any questions with below 50% correct will be listed below the Frequently missed questions. Questions are broken down individually and analyzed. Great for seeing what needs to be re-taught and what is already understood. 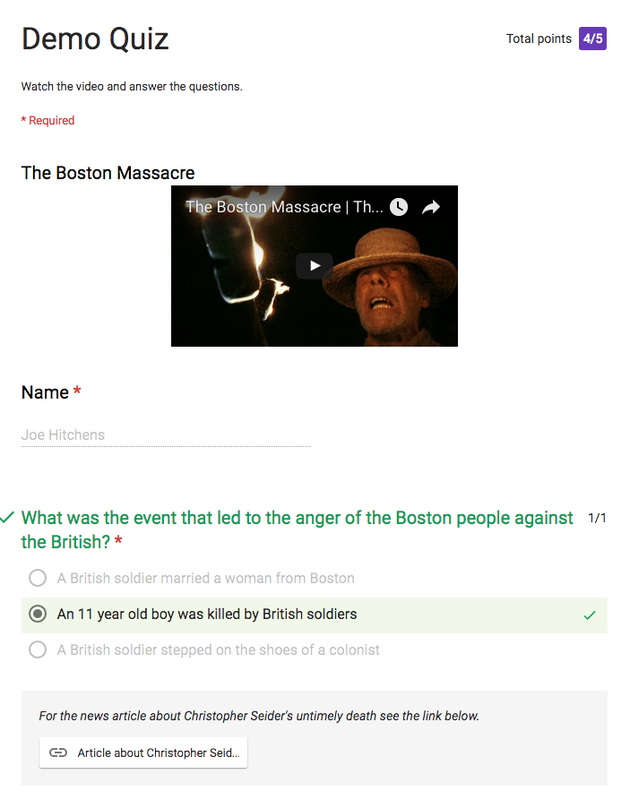 You can also choose to review the student quizzes individually. Overall, I have to give Google props for really coming with their A game on this new roll out. The instant and customizable feedback really stands apart from other formative assessment tech tools. However, as a teacher, I rarely give multiple choice assessments. They are not a great indicator of learning. 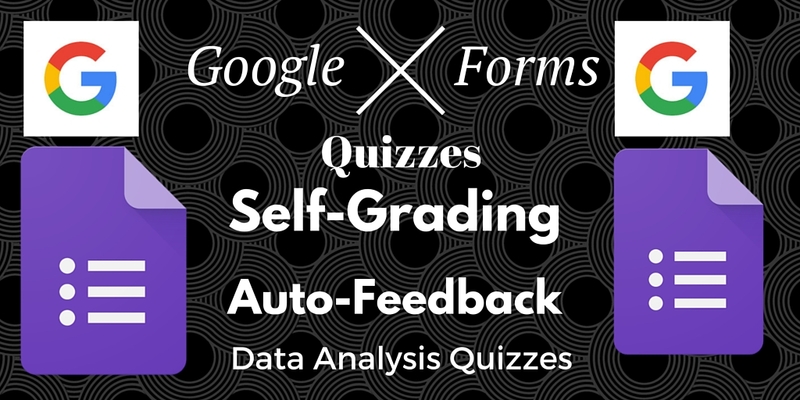 Because of this, I would most likely not use Google Forms Quizzes for graded assessments but rather as ways to introduce content to my students. 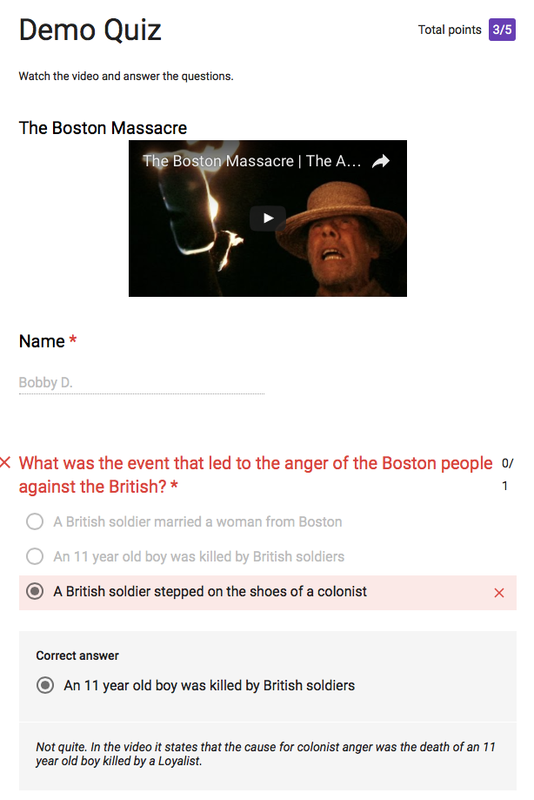 I would most likely have the students read background info (or watch video) about the topic we will be learning about that day, quiz them on their knowledge, and then break the class into "got it" it and "not yet" sections to make sure every student is learning. I'm sure there are many other ways to use this new tool and I'm looking forward to hearing from other teachers about the cool ways that they will use it in the next few months. 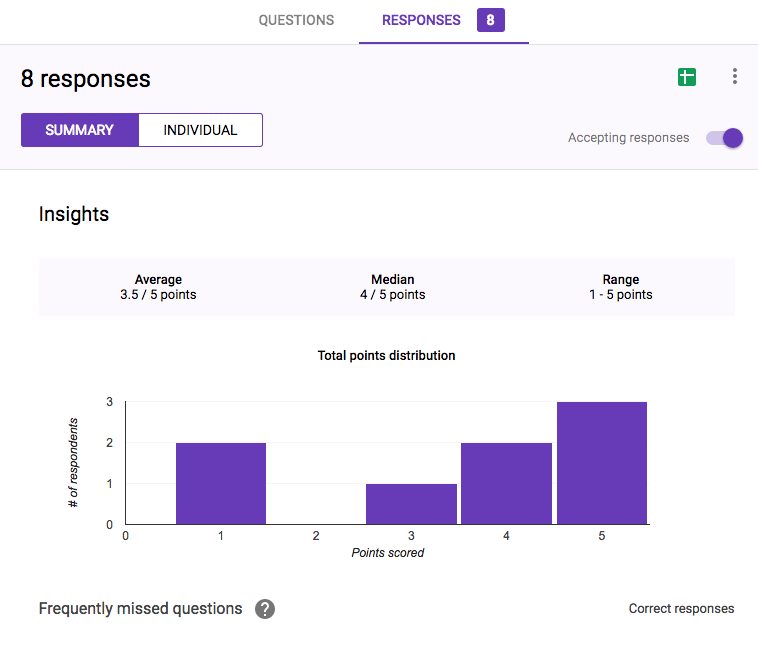 If you want to see tutorial of what Google Forms Quizzes can do, see the video I put together below. Geography is one of the key components of social studies education, yet it is an often overlooked aspect of many a teacher's curriculum. I myself am guilty of cramming the Five Themes of Geography into a very hectic one or two class periods. For too long, geography has been an afterthought of the social studies, but who can really blame us? 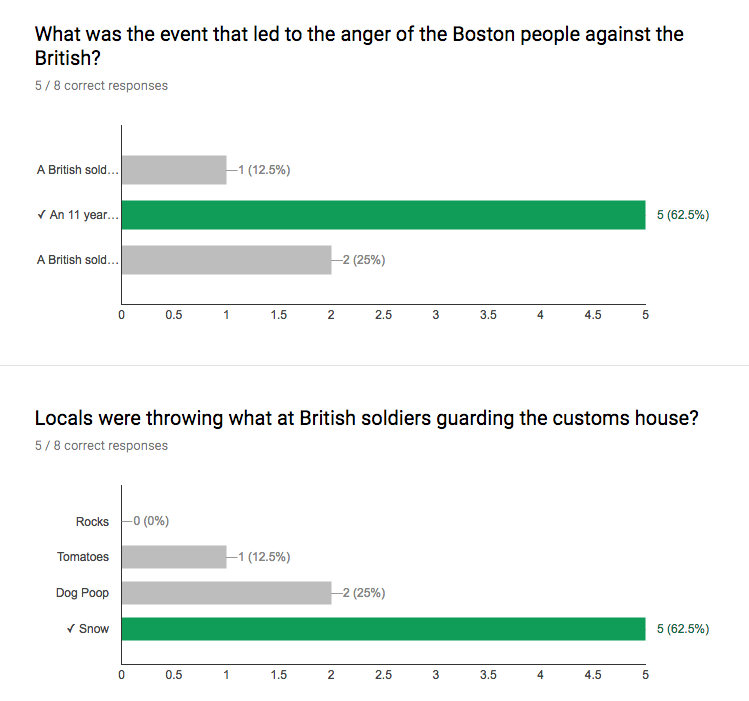 How could learning about human-environment interaction compare with the suspense of the Revolutionary War? How could absolute location hold a match to Julius Caesar crossing the Rubicon? How could place-physical...well, you get the point. In truth, geography may just might be the most interesting aspect of social studies. One might even make the argument that geography has had a greater impact on human history than all the political, social and economic systems combined. At the very least, geography shapes these human systems. I try to spend at least a few days a unit studying the impact of the geography on the place/civilization/event that we are studying. I have created mental maps with my class in the past but found them to be much too tedious and time consuming. Then, the lightbulb went off over my head. We live in an age of GPS, with nearly every single inch of the world explored and mapped by satellites in the sky. There had to be a way to leverage all this technology at my fingertips into a worthwhile geography education. I began experimenting with Google Maps and saw the potential. Then I came across Google My Maps at the 2015 GAFE Summit in Baltimore, where I observed tech wiz James Sanders challenge our group to create a zombie apocalypse presentation. The presentation required us to upload examples of us using GAFE tools in creative ways. I was already familiar with most of the tools except for Google My Maps. These pins can be changed to any number of other icons, but we'll get to that later. So what else can you do with Google My Maps? Well for starters, once you choose a location for your pin, you can attach photos, text, videos and links to that icon. Whenever someone clicks on that icon, they'll be able to see what you have added. Students aren't limited to simply adding icons to the map however. They can also draw lines (to represent rivers perhaps). Just like with the icons, you can choose what color the lines are. You can also adjust the line width and can even draw a line around an entire area to indicate a location. You can use the icons, lines and shapes to showcase the Five Themes of Geography. Google even lets you customize your icons to represent the location with more detail. As you can see in the map below, the icons all represent a different part of Chinese geography. Below is a map that a group from my World Studies 6 class created of China. They were each given the task of researching the climate, physical geography, human geography, natural resource and other important sites in a given region of China. The map came out spectacular. You can scroll in and out on the map, click on icons to see what they represent, see the images chosen for each icon and more. Some of the lines represent rivers and the red line represents the Great Wall of China. The larger shapes of the map are areas such as the Gobi Desert or the Himalaya Mountain Range. Try clicking on some of the icons below to see what pops up. Using Google My Maps gives students the opportunity to layer their own creation over a pre-existing map of the world. There are tons of other cool features of this product. To see a more in-depth tutorial, see the video below. I think the best part about this technology is that it goes above and beyond simple knowledge retention and requires the students to collaborate and create, which are higher level learning activities. The possibilities are endless. 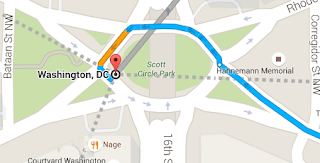 Google even lets you layer maps so you can show change across time. I can't wait to see how my students will surprise me the next time we use Google My Maps! I created the map above and included the stadiums of all NFL teams. I inserted a picture and video into each icon. I also tried to match the icon colors with the team's color. It was a fun little project!! Think your a geography wiz? Want to test your trivia knowledge? 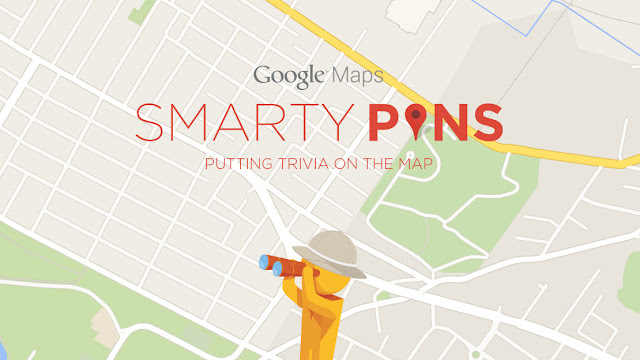 Smarty Pins was created by Google to test your geography and trivia skills. The gist of the game is that they give you a geography related trivia question (ie. in which city were the 1992 Summer Olympics held?). You click and drag your pin to the location that you think is right (Barcelona btw). Here's the catch. You start off with 1000 miles in the bank. Every time you are off (say you place a pin in Washington D.C. instead of Baltimore and are off by 35 miles) you lose that many miles from your bank. Once your bank hits 0, you're done. If you can answer in 15 seconds or less, you win back some miles. See how many questions you can get before you run out of miles. This is a great warm up activity for students to practice their geography skills and it's darn fun too! 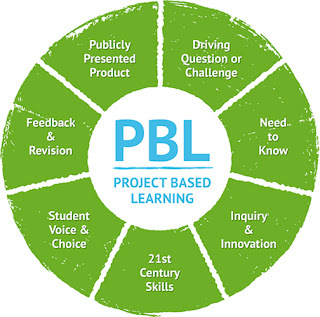 I have always been a fan of Project-based Learning. As a student who sat through way too many lectures during my academic career, I decided that I would not be that type of teacher for my students. I can still remember the few times I was actually given academic choice and how great it felt. This is why I try to include at least one project per unit. However, Project-based Learning is much more than simply assigning a project. Above you can see the diagram that includes the vital aspects of a true PBL-designed project. Before I get to the vital components of PBL, I want to share the outline for my end of the year World Studies 6 project so you can get an idea of what I'm talking about. Before I explain how my students got to their final product, I want to share their work with you. They collaborated, used technology, created an authentic display of their learning, utilized social studies skills and had fun doing it! This particular group went above and beyond my wildest expectations. They even embedded a Google Form quiz directly into their website to assess their audience. It looked visually appealing and included all the information I was looking for and more. I couldn't be more proud of these students. Below you will see how I addressed each vital component of PBL in this particular project. 1. Driving Question: The driving question that each group had to answer as they researched and created their website was: How did the values, beliefs and traditions of this civilization influence the political, economic and social systems? 2. Need to Know: Students started the project by compiling question lists that would help them find the necessary information to address the driving question. I also allowed them to come up with their own curiosity questions that helped them understand the civilization better. These questions ranged from what kind of fashion did they have to what types of sports did they play. 3. Inquiry and Innovation: Students began researching info about their selected civilization and logging it in a graphic organizer. They also chose which website tool they would choose (weebly, wix, google sites, or another tool approved by me). 4. 21st Century Skills: Students were conducting online research, sourcing their info, building a website to share their research, working collaboratively asynchronously, and even coding their own widgets in some cases! 5. Student Voice and Choice: Students were given the choice of one of five millennial civilizations (the Maya, Heian Dynasty, Carolingians/Holy Roman Empire, Abbasid Caliphate and the Kingdom of Ghana). They were also given the opportunity to choose the method of delivery for their research. 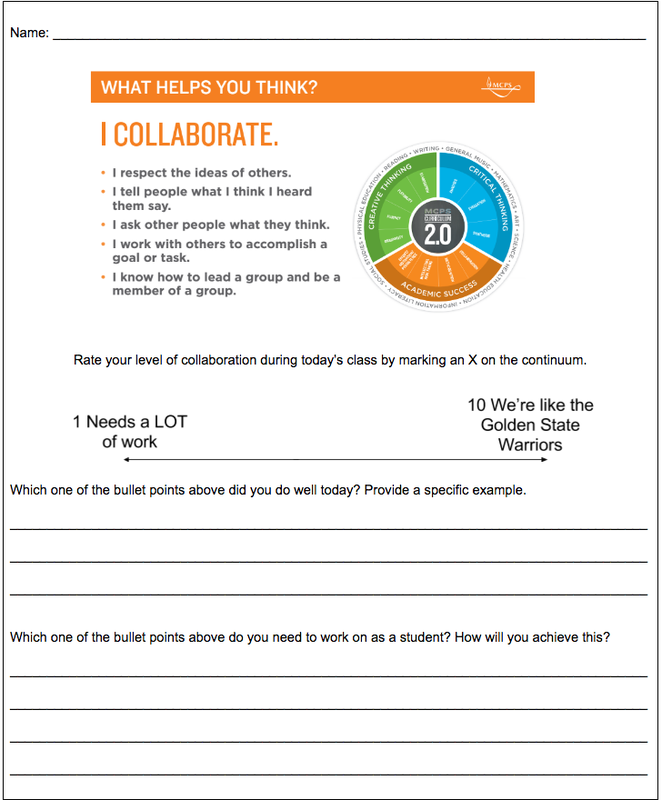 Students reflected every day about their collaboration on the project. 7. Publicly Presented Project: Can't get much more public than a website! Students were excited that something that they created could actually be used by other students and classes across the globe. Since this was the first year that I did a project like this, I took a few hours to create a model website of what I was looking for. I used weebly (my favorite) to complete a website about the United States. This gave the students a starting point or model with which to base their designs off of. I let the students know that they could take this in any number of directions and that they are only limited by their imaginations. Overall, the project went great. There are still some kinks to work out but I'm much more confident about assigning large projects such as this one in the future. The kids enjoyed the time spent on it, had an amazing product to showcase at the end and hopefully became more reflective learners and collaborators. There are just so many wonderful and inspirational educators out there that I decided to start a new feature of this blog. It's called the "Social Studies Superstar Spotlight" (I know, very alliterative). Every month, I will be placing the spotlight on a teacher who has gone above and beyond in the pursuit of teaching excellence. These teachers will be chosen based on their use of best practices, technology and passion for kids. I will propose a list of 10-15 questions for the Social Studies Superstar to answer and then share the responses with all of you fine people. Too many teachers live on the isolated island that they call their classroom. The purpose of the Social Studies Superstar Spotlight is to give all the wonderful teachers out there a glimpse into the classroom of a fellow social studies teacher. I also have made it my goal to increase my peer observations in my building and search out the best practices of my profession so these interviews also help me to become the best possible teacher that I can be. So without further ado, here is our first Social Studies Superstar!! Mr. Freeman was born in Tennessee but grew up in the Piedmont region of South Carolina. He graduated with a bachelors degree in Secondary Education from Clemson University in 2002. After college, he moved to the northern Virginia (NoVA) region. After spending time as a substitute teacher he landed a job at Stone Bridge High School in Ashburn, VA. He then earned a Master's Degree in Educational Psychology from the University of Virginia. In 2015-16 he was a founding teacher at the brand new Riverside High School in Leesburg, Virginia. He is a big sports fan (Clemson/DC sports) and a gamer (currently in the wastes around Boston in Fallout 4). He was chosen for the Social Studies Superstar Spotlight in part because of his amazing and awesome website titled "Freeman-pedia."